If you’re like me, you make promises every day, both to the people you’re in relationship with as well as to yourself. Maybe you have made a yoga promise, to support yourself through your daily practice or perhaps to offer seva. Perhaps it is a promise to dedicate your life to a higher goal — even the highest: Self-Realization. Swamiji has made the ultimate promise to us, to help us achieve the highest. She has dedicated her life to the upliftment of each and every one of us. My favorite aunt prepared me for this great promise. Aunt Lillian taught me that when someone walks a mile for you, you walk two miles for them. This means when someone does something for you, you repay the kindness twofold. 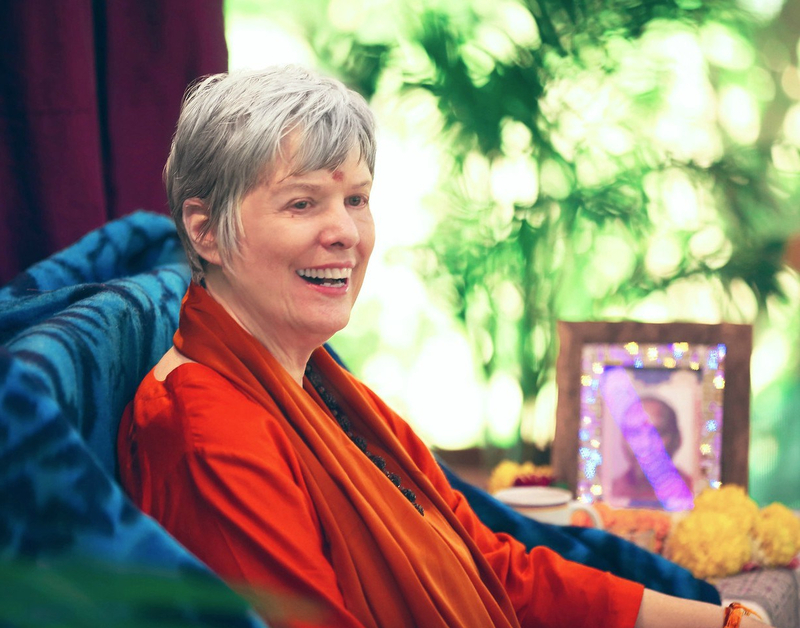 And when I think of what Swamiji does for me, I am thrilled to have an opportunity to offer something to her. When we survey participants in Ashram programs, invariably we hear about profound life changes. These inspiring stories come from Svaroopa® yoga teachers, from their students, from retreatants who have received Shaktipat from Swamiji, and even from people using the Freebies on our website. They say they are receiving exponentially more than they could have ever imagined. Is this true for you? Consider how these profound teachings have deepened your inner experience of your own Self. Maybe you experience a level of inner ease and peace of mind, that even affects your life decisions. Even if you want to, it’s not possible to repay this gift of dawning enlightenment. Yet we must find a way to honor and support the work of Sadguru Swami Nirmalananda, which so deeply benefits ourselves and our world. Please consider joining the other yogis who do so by making a monthly donation. Your monthly gifts ensure practical support for the continued stream of Swamiji’s teachings. You help sustain the faculty, staff, supplies and infrastructure that make her service to us possible. Your gift supports your yogic path, not only enabling you to do more than you think you can, but also contributing to you discovering that you are more that you think you are. When you make a monthly pledge, it’s a solemn promise. It’s a commitment, that you make and carry out, honoring and supporting the work of our Master Teacher — our Sadguru. Your gift has a twofold impact. It ensures that Swami Nirmalananda’s teachings reach you as well as others, extending far and wide to other seekers. It is also a profound yogic practice, whereby you invite yoga into your wallet, extending Grace into this important part of your life. Your financial gifts give you as much benefit as your daily meditation or poses, or even more. Over the next few weeks, you will get personal stories from our Board members. They share how making the promise to support the Ashram has touched and transformed their lives. We ask you to look into your heart for guidance on making your own promise, your own pledge. This entry was posted in Ashram News on October 22, 2018 by Svaroopa Vidya Ashram.